Assassin’s Creed is one series I never tire of. Some may argue that the yearly titles are starting to set in franchise fatigue, and to a point, I agree. But unlike other yearly releases, they are given ample development time, they are always trying new ideas and mechanics (some that stick and others that only appear once), and the sheer amount of content you get can be staggering. To me, they are like taking a walk through a history book, but with fun action doodles in the margins. I am currently working through Assassin’s Creed IV: Black Flag, since I play these on the consoles I waited till I was able to play the PlayStation 4 version of the title to jump in. For a cross-generation title it is quite stunning. Black Flag has been a dream come true since I finished Assassin’s Creed 3. One of the standout elements from AC III was the naval battles, which in Black Flag, take the forefront. As a bonus we received one of the best pirate themed games of all time, something Disney (Pirates of the Caribbean) could never deliver. Jesper Kyd has helmed most of the series as composer. Kyd composed the scores for Assassin’s Creed, II, Brotherhood, and shared duties on Revelations with Lorne Balfe. Balfe scored parts of revelations and Assassin’s Creed III. I have shared Balfe’s work on AC III on a previous Gaming in Stereo. Assassin’s Creed: Liberation, a spin off of AC III that landed on the PS Vita (later consoles and PC) was scored By Winifred Phillips. Black Flag was scored by Brian Tyler, known for the excellent Far Cry 3 soundtrack. Though some people, myself included, were a little disappointed when Kyd didn’t return for Assassin’s Creed III, but I feel it was for the better. Kyd did a great job differentiating the sound of AC and AC II, and I feel fresh composers did the same for the following titles. Today we are going to look at those different sounds with some tracks from Black Flag and Assassin’s Creed II. This track is simply beautiful. With the piano, stings, and vocals it feels very fitting for renaissance time period. 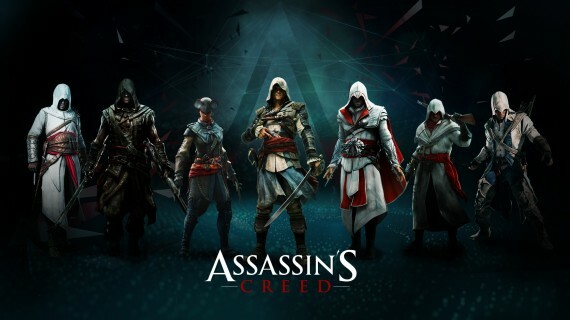 Since the Assassin’s Creed series is a tale of two time periods, one modern and the other a historical point in time, the track adds an electric guitar element at the (2:44) mark. Easily one of my favorite tunes from this series, enjoy! Brian Tyler captured the escapades of Edward Kenway perfectly with this theme. The drums and violins give a sea shanty feel, breathing a sense of playfulness in to the tune. The frantic drums at the (1:29) are the highlight, but like the game, this feels fun. You can feel in the music that Kenway likes his “privateer” lifestyle, though the game does have its more serious moments as well. I am going to let the bonus track speak for itself. There are epic drum sections later in the piece, so listen for those. This does show a more serious side to Black Flag, enjoy! The soundtracks are great! The Bonus Track is really nice with the drums in it! Great music!